ROUTE #2 – Runs all day 8AM- 2:30PM from LSU Lot 109 to Perkins/Stanford and then makes that route repeatedly. You’ll be in close proximity to the end of the parade. Many places to visit near the foot of the overpass! ROUTE #3 – This downtown route runs from parking facilities bene ath the I-110 interstate. 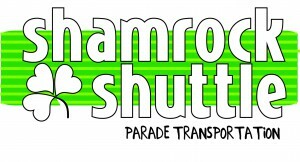 Shuttles run in a counter-clockwise manner from downtown, dropping riders off at City-Brooks Park – approximately mid-way along the parade route. It will stop by the Indigo Hotel for pickup. The Grand Marshal this year is Robert “Grey” Hammett and live streaming of the opening ceremonies will be available on the Parade Group website. The parade organizers are also offering an Uber promotion: When you download the Uber app for the first time, enter promo code STPADDYSBR for a free first ride up to $20. This promotion code will be valid until 03/30/15. Have fun and don’t forget to wear green or you might get pinched!